The American Iron and Steel Institute (AISI) has published Supplement No. 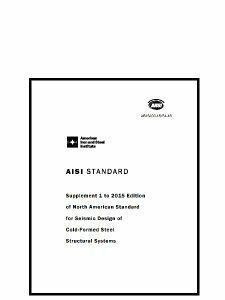 1 to AISI S400-15, North American Standard for Seismic Design of Cold-Formed Steel Structural Systems, 2015 Edition. While the standard addresses the design and construction of cold-formed steel structural members and connections used in the seismic force-resisting systems in buildings and other structures, this particular supplement revises the expected strength factors for cold-formed steel light-frame shear walls sheathed with wood structural panels, steel sheet sheathing, gypsum board, and fiberboard panel sheathing. The Supplement is available to download free of charge. It is available to download as: 1) a single document for users who are interested only in the specific changes, or as 2) part of the complete standard, designated as AISI S400-15 w/S1-16. AISI’s codes and standards work is conducted under the Construction Market Council of the Steel Market Development Institute (SMDI), a business unit of AISI, which oversees the industry’s investment in advancing the competitive use of steel by meeting the demands of the marketplace.